Come and recharge your battery in beautiful sunny San Diego. 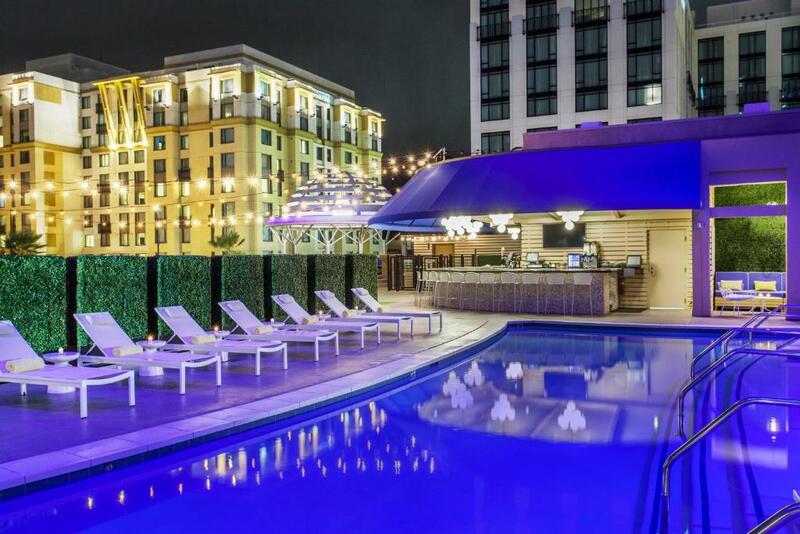 The Kimpton Solamar Hotel is just the place to be. At the Kimpton Solamar Hotel, you’ll feel truly connected. 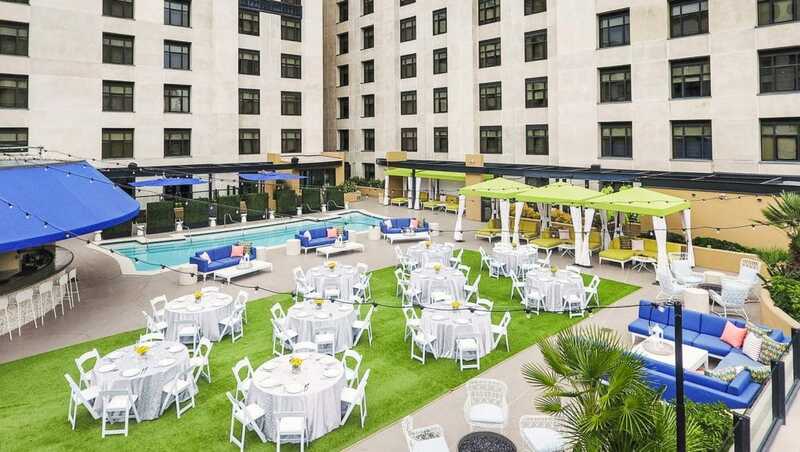 Located in San Diego’s East Gaslamp Quarter, it offers an all-inclusive vibe with rich decor. Here, regal meets vibrant, urban refuge provides modern-day comfort, and a rooftop pool offers the perfect oasis. That’s not all. Prepare to be dazzled. From spectacular dining to genuine service, and an ideal location, this luxury getaway truly has it all. Let’s go explore this sun-kissed city. Unwind in sophisticated SoCal style. San Diego is the perfect balance of mellow and chic. It’s much less hectic than LA and even more mellow than OC. What can we say? A mild climate and the little things in life feed the soul. The Kimpton Solamar Hotel has done an impeccable job of weaving an airy, hopeful vibe throughout their accommodations. 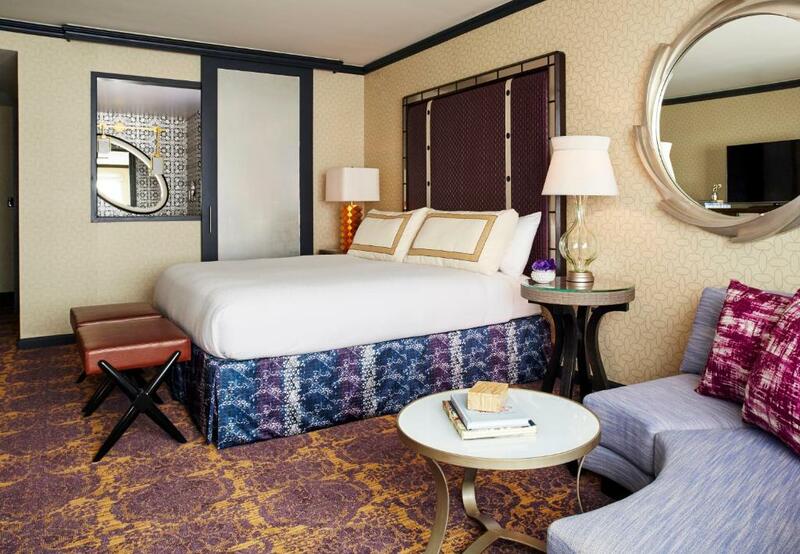 Guest rooms and suites feature bold geometric shapes, subdued hues, and a lovely pop of purple. Travelers absolutely love the suite-like arrangement of rooms that allow ample place to lounge and work. Top-notch amenities are ever-present when you’re ready to catch up on your much needed R&R. Explore elevated style. We love how the guest rooms complement San Diego’s casual, spirited vibe. 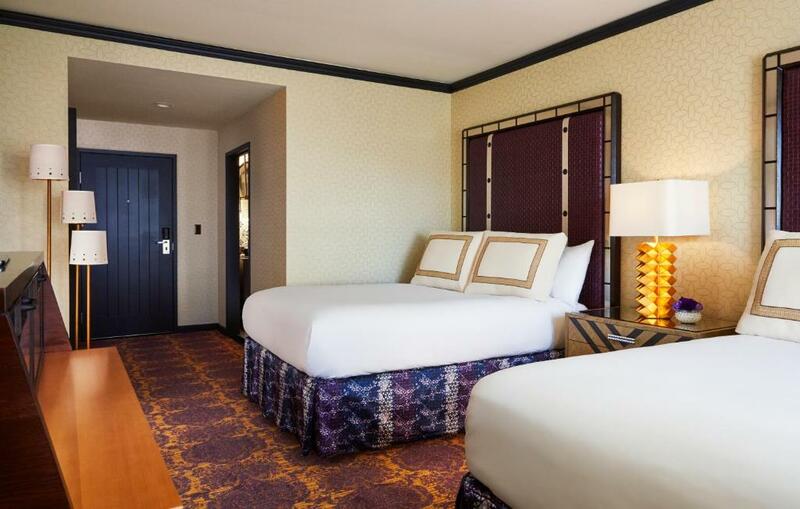 Guests relish in recently-refreshed rooms true to San Diego’s warm, inviting nature. Highlights include a carved settee, surfboard-shaped vanity mirror, and a subtle (yet much appreciated) palette of blue, gold, ebony, and berry. In addition, designers have incorporated charming local references through the interior elements. Look closely enough and you’ll see Balboa Park silhouettes appear in the mirrors. Take your pick from six lovely guest rooms. Spacious, flirty, and sophisticated, these hotel suites showcase San Diego skyline views. 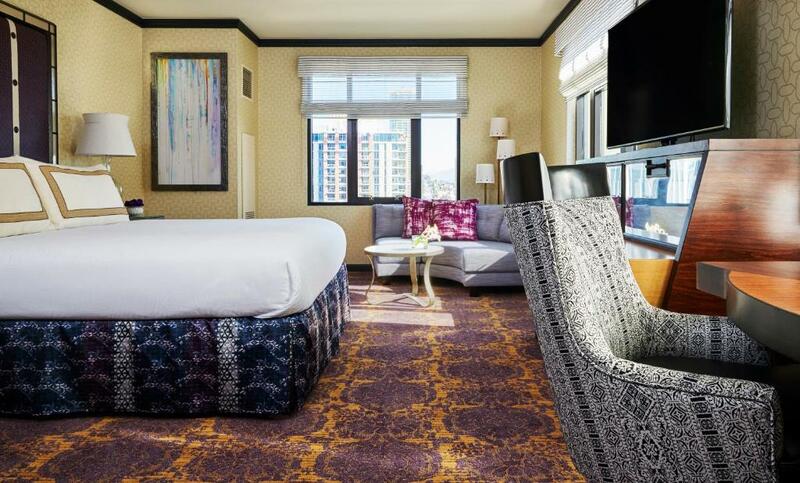 Life just got even suite-er inside the Kimpton Solamar Hotel. These specialty suites have more space than you’ll know what to do with. But hey, that’s never a bad thing, right? Enjoy amenities galore and skyline views that will take your breath away. Choose between a Masters Suite featuring a relaxing Fiji soaking tub, the Luna Suite, complete with an outdoor patio and dining table to host friends, or the Virtuoso Suite, offering a full living area for extended stays. Or you could just move in forever. Who wants to leave this city anyways? 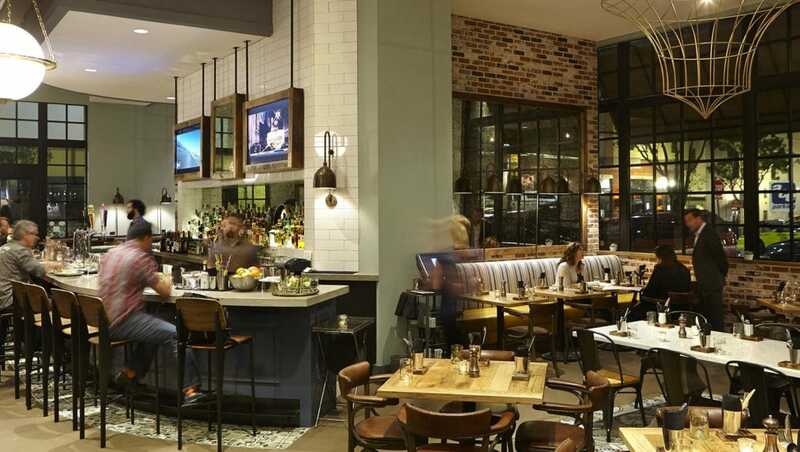 The Kimpton Solamar Hotel has certainly wowed us with their fine dining options. Jsix, their modern American restaurant, features a bustling open kitchen and ever-rotating menu. They serve up nothing but the finest, freshest ingredients. Take a look at the menu and sample some tasty eats. You may notice the cuisine carries subtle influences of Chef Sinsay’s Filipino heritage. All in all, Jsix is a delight for the senses. You’ll find it located adjacent to the Kimpton Solamar Hotel. A popular neighborhood restaurant and bar, it’s a hot spot for grabbing wine and an appetizer among the locals. Jsix has developed a reputation as a strong leader in sustainable sourcing and of its knowledgeable staff who know their way around fresh flavors and local fare. Monday - Friday | 7:00 a.m. - 10:30 a.m.
Saturday - Sunday | 8:00 a.m. - 10:30 a.m.
Saturday - Sunday | 8:00 a.m. - 1:00 p.m.
Tuesday - Saturday | 5:00 p.m. - 10:00 p.m.
Tuesday - Saturday | 4:00 p.m. - 10:00 p.m.
Tuesday - Friday | 4:00 p.m. - 6:00 p.m.
Socialize in high style in downtown San Diego. 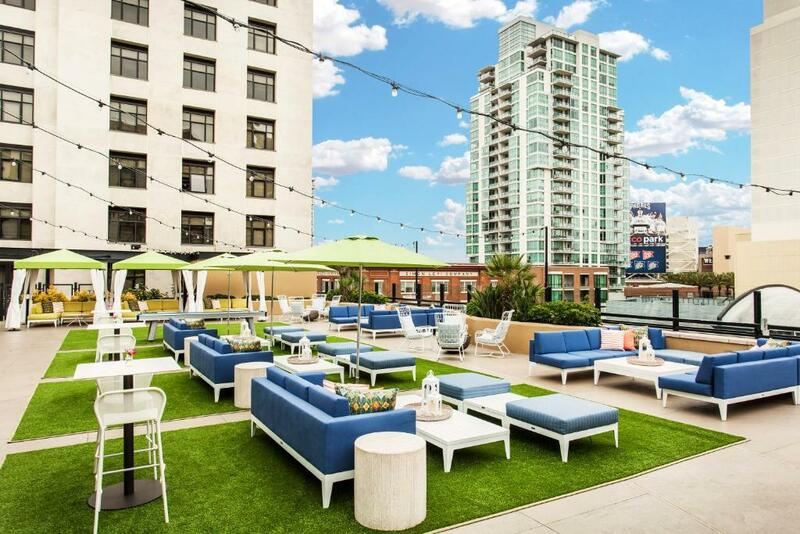 Come and experience San Diego’s most renowned rooftop bar located in none other than the Kimpton Solamar Hotel. As fellow travelers, we understand you’re always on the search for the next hottest place. But we also know that you’re not into navigating the pretentious nature of so-called VIP spots. The Kimpton created the perfect intimate scene that’s friendly and accessible in the best way possible. When you’re ready for a drink, simply take the elevator to the top. A lush oasis beckons you in. Immediately, the scene evolves from serene to sultry. The bar scene is buzzing, as servers sling artisan cocktails to cosmopolitan guests. If you’re hungry, satisfy your appetite with delicious small-plates like rosemary French fries or house made charcuterie platters. Close your eyes and feel the cool salty breeze on your skin. Listen to the firepit crackling. There’s no doubt that life here is real good. You’ll find us cozying up by the fire pit, ready to unwind in one of the private rental cabanas. There’s also lovely poolside chaise lounge rentals available. Here, the amenities never stop flowing. Guests are given pool access, fresh towels, refreshing ice water, and other great summer treats. Whatever you’re celebrating - or maybe just in the mood for - come on out. Book a weekday cabana or your weekend fiesta. The choice is entirely up to you. Eat, drink, and be merry with private, customized dining options. Fine dining gets a lift at the Kimpton Solamar Hotel. When it comes to private dining options here, the sky’s the limit. Here, creative, flavorful, and healthy food is valued. The hotel and attentive staff pride themselves on carrying out a luxe decor and positive spirit into every space they touch. Both Jsix and the hotel itself offer four venues to accommodate your private dining needs. 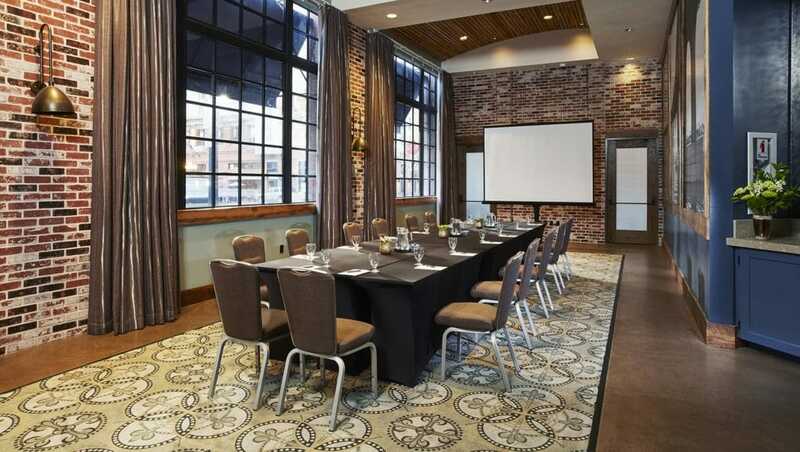 Choose between the stylish Jsix Private Dining Room or a variety of other options in the hotel for events ranging anywhere from 20 to 300 guests. In the event you’re looking for information about catering menus, wedding packages, or booking your next event, see their website for further booking detail. You want it? You got it. Here at Kimpton Solamar Hotel, service is sincere and team members always have smiles on their faces. Take advantage of all the amenities this hotel has to offer. Hint - it’s a lot. Highly attentive, unpretentious staff cater to everyone who passes through the doors. This includes the kids and pets. Oh yeah. We forgot to tell you. This hotel is family and pet-friendly. Could it get any better? Treat yourself to a day of sun and relaxation at the rooftop pool, some delicious dining options, wellness programs, free bike rentals, in-room spa services, and more. Last but certainly not least, there’s also a hosted SoCal hour that features great local brews as well as the standard Kimpton Solamar Hotel perks too. Healthy Travel: Take one of Kimpton's custom designed PUBLIC bikes for a ride around town. Our hotel bikes are available for all of our guests to enjoy. It gives us peace of mind to know your body and mind's at peace. That's why we supply a yoga mat in every room, free of charge. Make waves above the city in the hotel’s terrace pool. Considering San Diego’s weather tends to be a dream year-round, life here is spent outside as much as possible. Who wouldn’t want to relax under clear blue skies and perpetually 75-degree weather? The Kimpton gives their guests prime places to do just that. Enter the divine rooftop oasis. Here, you’ll find three open-air environments. The Terrace features fire pits and private cabanas, the Shore Pool is heated year-round, and Upper East offers a buzzing social scene, fresh fruit cocktails, and mouth-watering brunches. Why shouldn’t you begin and end your day on the pool deck? Turn your full vacay mode on. Run, bike, life, and even hula. Who says fitness has to be boring? Boost your spirits in this energizing hotel gym. In this beautiful city, the ocean breeze should be enough of an incentive to run and stay fit. To keep things in balance, the Kimpton Solamar Hotel created an inviting space to help you keep in tip-top shape. Stay toned and stretch out in this 24-hour gym on the fourth floor. 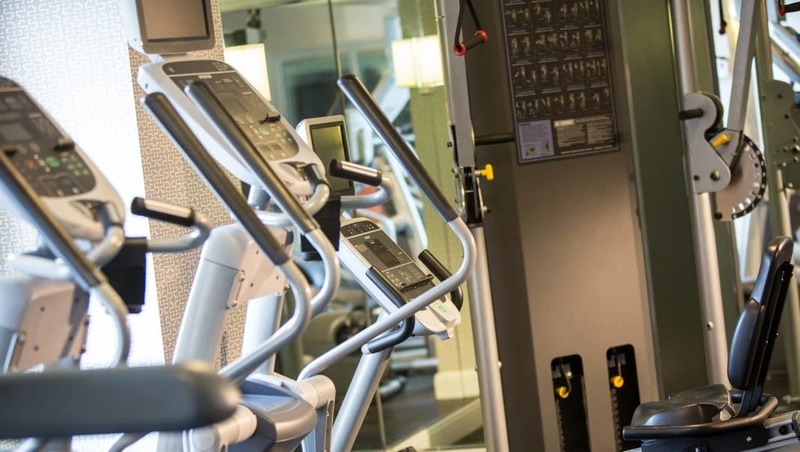 Here, you’ll find state-of-the-art equipment including two ellipticals, one treadmill, two bikes, a circuit machine, free weights, and even hula hoops for your workout routine. Hey, why not mix things up a bit? In addition, you can also borrow one of the hotel bikes. Just ask the concierge where a nearby running path is or just for some suggestions on where to explore in the city. Last but not least, if you’re a local, take advantage of their discounted day passes to their neighborhood gym Fit Athletic. The Kimpton Solamar Hotel welcomes your pets with open arms. Cats, dogs, birds, snakes, you name it… At no extra charge, the hotel extends your reservation to your pet. In addition, they’re offered goodies, water bowls, and a personalized greeting at check-in. Feel free to include them in your vacation fun, even bringing them along for happy hour in the living room. How cool is that? Want to hear an added bonus? Ask the concierge for a list of nearby pet-friendly restaurants, parks, groomers, and pet boutiques. The zen comes to you. Finding tranquility has never been easier. Let the Kimpton staff bring the relaxation directly to you, as their talented team members arrive at your Kimpton Solamar Hotel door to deliver decadent massages and other soothing spa treatments. Whether you need to unwind after a long day of meetings (or heck, a long day the pool), they’re happy to help you tend to that mind-body-soul balance with maximum convenience. We hope you enjoyed learning about all the luxury the Kimpton Solamar Hotel has to offer. We’re in love with this luxury boutique stay right in the heart of the city. In addition, there are so many lovely places to explore and things to do in San Diego. Some of our favorite restaurants, bars, and breweries are right here. Do you still want to see more of California? Orange County is only an hour car ride away. The Golden State truly is something. Next articleWould You Eat Air New Zealand’s Vegan Burger?